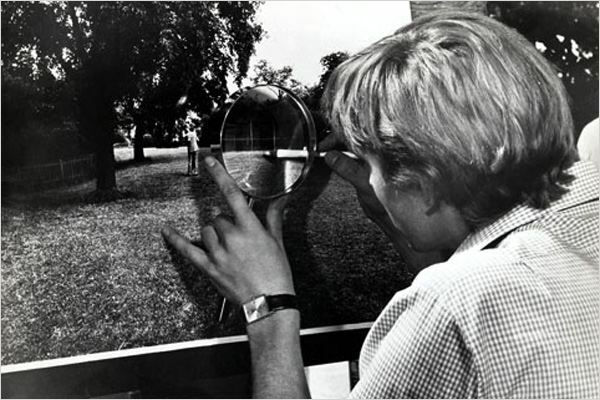 In 1966, Michelangelo Antonioni released his first English-language film, Blow Up, in which he introduces a photographer played by David Hemmings, who realizes in his dark room that he may have captured the evidence of a crime on one of his photographs. Intrigued by a detail in the background of the picture he took, he undertakes to ‘blow up’ this detail (something proper to film photography) to a point where he is able to confirm his suspicion. Similarly, a few days ago, I realized that the most updated Google Earth data for Gaza consisted in photographs taken on July 29, 2014, the day when the Israeli army bombed the single power plant of the Strip (see this July 2014 map to understand the electric power supply in Gaza). The photographs show a large cloud of smoke spread over the land of Gaza as an evidence of the dreadful action of the Israeli army against the 1.8 millions inhabitants of the Strip, since those of them who were not directly suffering from the destruction of their homes had nonetheless to face shortage of electricity, clean water and sewage because of the power plant bombing (see past article). Google uses a mix of satellite and aircraft photography in order to compose their representation of the Earth and, just like in Antonioni’s movie, we could think of a coincidence for the satellite to be present a few moments after the bombing, and it has been suggested to me that Google deliberately kept this imagery as a form of geopolitical positioning. However, the last murderous siege on Gaza (July-August 2014) cannot be compared with the crime depicted in Blow Up: there is no coincidence or, rather, the coincidence is continuous. The cloud of smoke we see on the photograph above is particularly spectacular as it comes from a large electrical infrastructure and, if we follow Eyal Weizman in his descriptions of these clouds/mushrooms over Gaza, we can even say that, to some degree, the cloud is the power plant itself, manifested in another form. Nevertheless, the Israeli army’s 2,695 bombings during the 50 days (an average of a bombing every twenty-six minutes) of the so-called “Operation Protective Edge,” as indexed by Amnesty International in association with Forensic Architecture (directed by Weizman), produced as many clouds of smoke. The latest fascinating research undertaken by Forensic Architecture (soon to be released) precisely investigates these clouds/mushrooms as temporal and spatial keys in order to reconstitute the specific enactment of the so-called “Hannibal Directive” on August 1, 2014, when the Israeli army is suspected to have taken every possible action to kill one of its own soldiers who had been captured. The various photographs (satellite and on ground) and films collected from this specific days allow Forensic Architecture to temporally and spatially coordinate what they show in order to reconstitute the course of events (more on that when the research will actually be released publicly). We should however not forget that the crime of the Israeli government and its army against Gaza is not temporally circumscribed to its regular bombings and its three operations in 2008-09, 2012 and 2014. As written in the past (see “The Continuous Siege“), the latter are ‘only’ the manifestation of an extreme and spectacular violence that tends to obliterate for the external viewer, the normal forms of violence that the territorial organization of Gaza continuously manufactures. In other words, the dark cloud of smoke that Google Earth show us hides (almost literally) the 70 kilometers of wall that incarcerate the Gaza Strip. 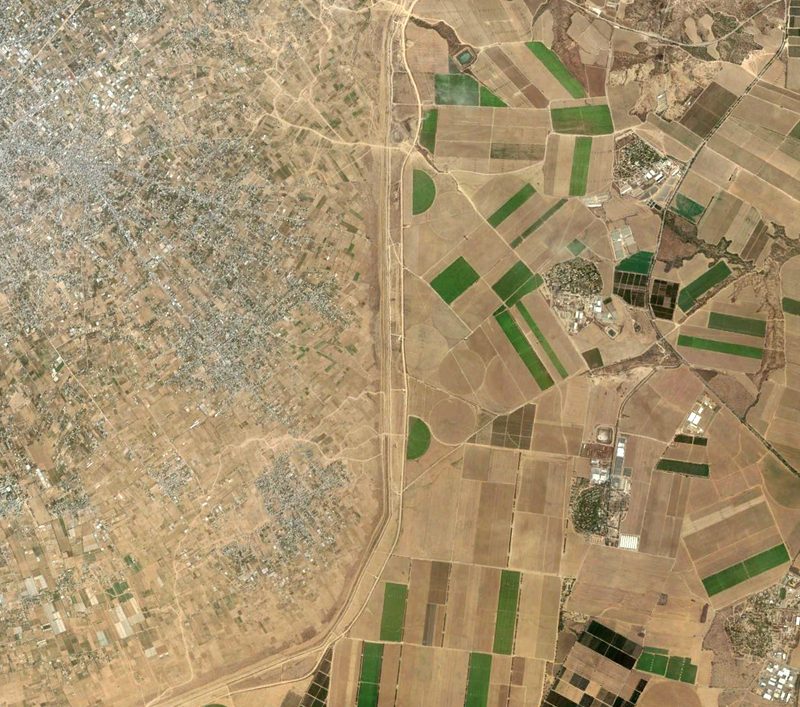 Any aerial photograph of the Gaza Strip of these last 15 years will clearly show the scar of Apartheid, separating the Israeli well-irrigated agriculture from Gaza’s dry land to a point that the Strip’s limits can be recognized at any scale even by a non-alerted viewer (see photograph below). As Weizman argues in his latest book, The Conflict Shoreline (Steidl 2015), written in association with Fazal Sheikh‘s photographs of the Negev (more on that soon), the surface of the earth itself can be considered as a photographic surface from which evidences can be collected. This work also takes part of a current exhibition about the forensic potential of photography at Le Bal (Paris) under the name “Images of Conviction: The Construction of Visual Evidence” curated by Diane Dufour. 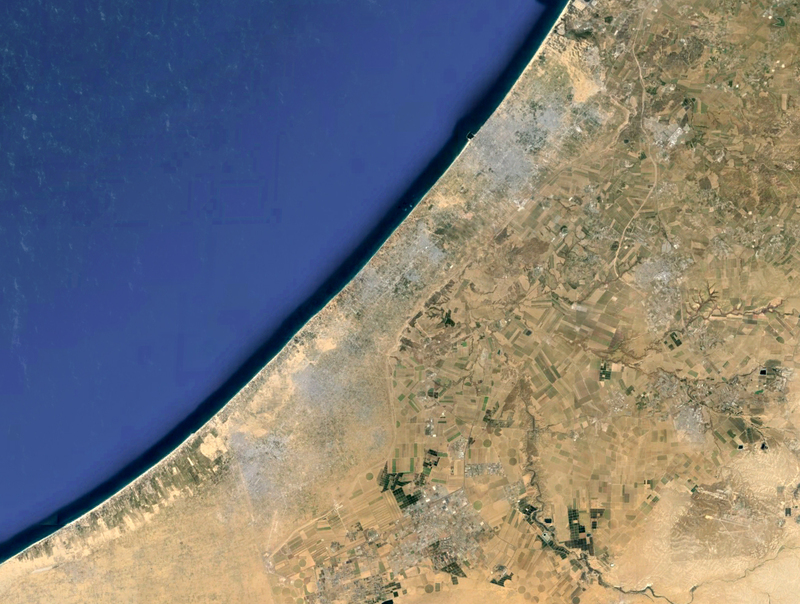 The Gaza Strip is clearly recognizable by the strong ground impact of its enforced boundary. Although photographs’ degree of incrimination varies depending on what they actually show, it would therefore be a mistake to assume that some images constitute evidence when some others do not in the case of geopolitical criminality. Only specific and precise readings of these documents can make them talk like prosopopeia (i.e. the speech of things, see past article). Sometimes, this implies looking at a particular aspect of representation that do not seem immediately related to the crime itself. This is how Weizman recounts how Forensic Architecture worked in collaboration with a researcher on Global Warming who uses satellite data showing where photosynthesis operates and where it does not. In doing so, they were able to map the paths of Israeli tanks outside and inside the Gaza Strip as the various plants on which they drove irremediably died under such weight. Although an aerial photograph would not reveal these paths, specific data detecting CO2 does. Forensic, by definition, intervenes after the crime was committed and, thus, do not prevent it to occur and political forces should be as much applied to the prosecution of its perpetrators as to the prevention of its repetition or, in the case of the continuous crime at stake here, of its cessation. However, impunity certainly provides the conditions of such repetition, and the investigative work we might exercise in the Blow Up operation of exhuming the evidence from the photograph (or whatever else document for that matter) is therefore crucial in the fragilization of this same impunity it might trigger. we wrote a note about your work, we are from Argentina and we are working with political chartography. Our english is not very well, but we follow your web. there are some works about video-surveillance, happy trigger and femicide. Thank you very much for your message and for following the work from Argentina. I will explore your website and try to understand despite my poor (non-existing!) Spanish skills. Stay tuned as many more maps are to come!